Nearly nine months after it was first announced, the Under Armour stock split date is finally here. And we sifted through all the details of the Under Armour stock split to bring you the most important information now. After today's (Thursday) close, Under Armour Inc. (NYSE: UA) will issue a new class of stock that will be distributed to investors via a 2-for-1 split. 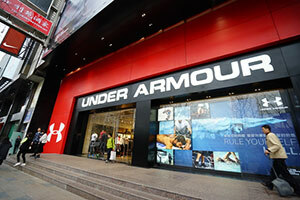 Shares of Class C Under Armour stock will be distributed after the close to stockholders of record of Class A and Class B stock on March 28 on a 1-for-1 basis. Regular trading for Class C shares starts tomorrow, April 8. Shareholders will see the adjustment to their Class A stock on April 8. Class A shareholders who sold shares between March 23 and April 7 are entitled to the Class C shares. The new shares will not give holders the power to vote on board elections, company resolutions, or other matters. The April 7 Under Armour stock split marks UA's third stock split in as many years. And more Under Armour stock splits are likely. The company doesn't plan to conduct another Class C split. But Under Armour said during its August 2015 shareholder meeting that there will be "lots more regular splits" in the future. Founder, Chairman, and CEO Kevin Plank owns all the Class B shares. Those have 10 times as much voting power as Class A shares. The new class of stock, which comes with no voting rights, ensures that Plank retains control over the company. As of Sept. 30, Plank owned 35,700,000 Class B shares and 76,445 Class A shares. That represented approximately 16.6% of the total Class A and Class B outstanding stock and roughly 66.5% of the voting power. Should I Buy UA After the Under Armour Stock Split Date? Plank is a Maryland native and former special teams captain for the University of Maryland football team. He launched Under Armour in 1996 in his grandmother's basement. He started the company with a prototype for a sweat-wicking compression shirt. His aim was to create workout and performance wear that was superior to cotton T-shirts. Plank has built Under Armour into a $19 billion company and a formidable rival to Nike Inc. (NYSE: NKE). Today, Under Armour sells sneakers, golf shoes, workout accessories, and tech devices that help athletes improve performance. Under Armour has lucrative sponsorship agreements with star athletes including Tom Brady, Stephen Curry, Lindsey Von, Jordan Spieth, and Dwayne Johnson. The Baltimore-based company is also aggressively tapping into the lucrative athleisure wear space. The company recently hired new executives to lead its women's apparel and footwear division. In January, Plank forecast its women's business will eventually outsell its men's business. In August 2015, Plank signed a non-compete agreement with Under Armour for five years if he leaves the company. That's important to many investors who believe he is the driving force behind Under Armour. Plank argued for the new Class C stock as a way to maintain a "founder-led approach" to corporate governance that has indeed resulted in soaring sales, profits, and stock value for a decade. Under the new plan, should Plank's ownership fall below 15%, all of his Class B shares would convert to Class A shares. That would effectively end Under Armour's uneven voting structure. Plank owns 15.9% of the company's outstanding stock but controls 65.3% of the voting shares, according to the company's latest proxy statement. Under Armour stock has been a star performer since its November 2005 IPO, when the company priced shares at $13. At a recent price of $85.75, Under Armour Class A shares are up 200% and 370% over the last three and five years, respectively. Tuesday, FBR Capital raised its Under Armour pre-split price target to $118 from $115. The firm said Under Armour's domestic footwear and international growth will increase the company's visibility and drive growth. FBR also increased its earning per share estimates for 2016, 2017, and 2018. The firm's new estimates are $1.39, $1.89, and $2.34, respectively. That's up from $1.35, $1.79, and $2.31. "I think [Under Armour stock] is going up," Barton said on his regular appearance on FOX Business. "I think they're going to get a great hit as the NBA season winds down. Steph Curry, the company's bell cow, is really doing amazing things." And the company's star power isn't the only reason for optimism. "They have a lot of good things going on, especially in China. They're catching Adidas for number two in China, so they're doing some really great things overseas as well." ok, so how about for those of us who bought a boatload of shares AFTER March 28th but before the stock split date? The price drops in half, yes. But the number of shares you own will double. So the value of your investment is unaffected by the split.